What's a summer without State Fair? I don't know, but I do know that this year was not all that fun if I'm being completely honest. Only because it was so much more crowded than it normally is that we just didn't get to see/do as much as we normally would. I don't know what the crowds were all about, but they were insane. We didn't go through animal buildings, didn't see pig races and didn't get a cream puff. We did, however, go on the big slide, spend a lot of money on food and watch a monkey show. 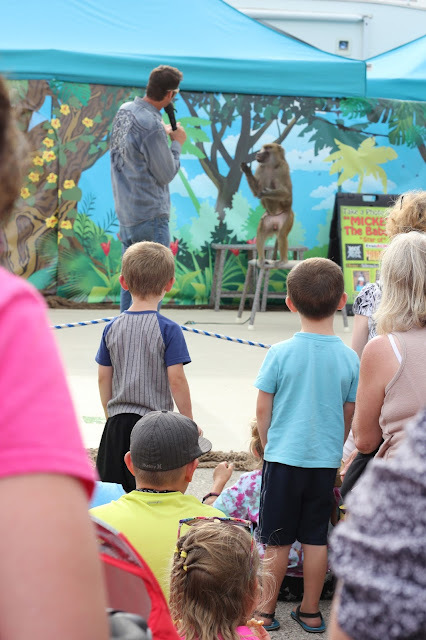 Simon and his cousins were sitting right up front at the start of the monkey show and the SECOND Simon saw that baboon emerge he was on his feet and running to the back. After a few seconds of realizing he wasn't going to be attacked, he slowly inched his way closer and loved every second of the show (frankly, so did I). That's how we felt last year so we're not even going to try this year. Hope it will be better next year but last year with a 2 year old in a crowd - NIGHTMARE. At least you have some nice memories. Ten is the magic number? !